A beautiful litter bred by Mary Hickey, club member. Bringing a new Boxer puppy into your home is a big responsibility and one that should not be taken lightly. To help you with your search for a new puppy, as well as helpful hints on what to do when you bring your new puppy home, we have put together this page of helpful links and information. The BEST place to meet breeders is at a dog show. They LOVE to talk about their dogs, and if you approach them at an appropriate time, they would be happy to speak with you. Another wonderful alternative is "rescue". 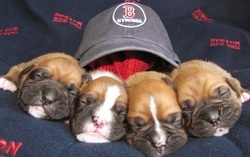 Ask a breeder how you can help rescue a Boxer! We have dedicated a full page to links and information on rescue. 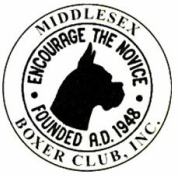 The Middlesex Boxer Club has two delegates, Ellen Bradley and Kathy Frohock that belong to the national Purebred Dog Breeders Referral Service. These delegates will have information from club members about recent litters. If there are any puppies available, you will be given email addresses or phone numbers to contact them. It will be up to the puppy seekers however, to evaluate the puppies, as the club's delegates are not able to endorse or screen the individual breeders or their litters. For Boxer breeder referral please submit the form below. CRATE TRAINING: The breeder of your new puppy will probably recommend crate training. The basic idea is that puppies do not want to soil the area where they sleep....thus they more rapidly learn to do their business in the proper place when taken from the crate directly to a designated outside area. Crating your puppy while you are away will provide a sense of security for both the owner and the puppy. A crate will also keep a nosey puppy out of trouble when it can't be watched at home. Get a good sized crate to begin with. The puppy will usually learn to love its crate and want to nap there as an adult. EAR CROPPING: More and more people looking for a family pet are choosing not to have the ears cropped. If you do prefer the look and decide to crop, the breeder can tell you where to go to have it done. It is very important to have it done by a vet experienced in this procedure. "Follow-through" of the healing and posting process is crucial. A responsible breeder should guide you through this. Also you should be made aware that it can take up to six months or more of posting for the ears to stand correctly. ECHOCARDIOGRAM: Breeders are striving to reduce the number of heart problems in the boxer breed. Responsible breeders will usually have had this procedure done by a board certified cardiologist before the breeding to determine that the sire and dam are clear of SAS. Sub aortic stenosis is a heart valve problem that can cause early death if it is severe. FENCING: Most responsible breeders will ask if you have a fenced in yard. If you do not have one, ask your breeder what they would recommend. Boxers, being very impulsive, do not do well with tie-outs or invisible fence systems. Some boxers are "jumpers" so the height of your fence is important as well. FLASHY: This term refers to the white markings on a boxer's face, neck and legs. If there is some white around the muzzle, between the eyes, above the ankles, or around the neck, a pup may be considered "flashy". Those with an all black muzzle and just a small amount of white on the toes and chest, will be referred to as "plains" or "classics". Breeders sometimes will want to hold on to certain flashy or sometimes plain pups as "show prospects". These are the ones they feel may be able to attain their championship in the show ring. HEALTH GUARANTEES: Some breeders offer these but they vary widely in interpretation. There is no way to guarantee the health of an 8 week old puppy. It is therefore up to the purchaser to ask as many questions as possible about the health testing of the sire and dam and about the longevity of ancestors. A responsible breeder will be frank about these matters and will be willing to show paperwork as proof of testing. Boxers do have their share of health problems, cancer being highest on the list. Some of these problems, such as cancer, cannot be screened for until genetic markers are found. At the present time we do not know how much is environmentally caused and how much is due to genetic predisposition. HIP DYSPLASIA: Hip problems in boxers are not yet as common or as debilitating as in some other breeds. Some breeders do routinely screen for this and will have PENN hip or OFA certifications. HOLTER MONITOR: This is another heart screening procedure whereby a monitor is hooked up to the dog for 24 hours. Breeders will usually have this test performed annually. This is a tool to screen for cardiomyopathy which is caused by severe arrhythmias that can also cause early and sudden death in boxers. MURMURS: Heart murmurs are are very common in the boxer breed. Recent studies have shown that possibly as many as 50% may have some sort of murmur. They are often called "puppy murmurs" and will disappear as the puppy matures. Some may never disappear, but are considered normal murmurs that will not shorten a dogs life. If your vet indicates that your puppy has a severe murmur, you may want to go to a "board certified cardiologist" for an ultrasound. If the cardiologist does determine that the pup has SAS, you should ask for an opinion as to the severity. Over a certain grade level, you would never want to breed your dog, but up to a grade 4, your dog can pretty much be assured of living a normal life span. SHOW HOME: Sometimes a breeder will be willing to place a "show prospect " puppy in a "show home" if the conditions are favorable to both parties. This arrangement will obligate the the puppy owner to allow this puppy to be shown in conformation (the breed ring) and be co-owned by the breeder. Terms for this arrangement vary widely but it can become a very satisfying arrangement if both parties are totally involved and compatible. TEMPERAMENT: You probably want to purchase a boxer because you have heard this is the ideal family dog. Yes, they are sweet, super smart, fun-loving dogs and especially good with children. However, they also have boundless energy and need lots of exercise and personal attention. Personalities vary in dogs, just as in people. Some are more boisterous than others. Your breeder will be able to tell you about the temperament of the sire and dam and possibly can guide you in picking the personality that will most readily fit in with your family or lifestyle. TEMPERAMENT IN THE TEENS: Remember that at 6 months old, your puppy, even though it appears to be almost full grown, has not reached full mental maturity. When puppies start into puberty and teen years, between the ages of 6 and 18 months, they can go through some very quirky stages. This is an age when frustrated owners may be tempted to turn a puppy over to a rescue organization. Be sure to consult with your breeder about classes and training facilities that may help to get you and your pup through some difficult stages. Don't give up! The best is yet to come! VETERINARIAN: When you purchase your puppy, you will probably be given a certain time period in which to have a health check done by your veterinarian. Do some research in you area and try to find vets that have been recommended by your breeder or other dog owners in your area. It is very important to get your puppy off to the right start by finding a vet with whom you can feel comfortable and establish a long term relationship. WHITE PUPPIES: One fourth to one third of many litters will include white puppies. A very small percentage of these white pups may be deaf just as in Dalmatians. Most white puppies, however, are identical in health and temperament to their colored littermates. The white pups cannot be shown or bred though, because white is a dominant color and if bred, white would become the predominant color of all boxers over time. Breeders will often "place" these white pups. The American Boxer Club's "code of ethics" states that white puppies cannot be sold so they are usually placed for a very nominal fee to cover the expense of tails, dew claw removal, shots etc. Breeders may also include the approximate cost of neutering and refund that money to the puppy owner upon proof of such spaying or neutering at a later date.